Cereal. It’s what’s for breakfast, right? Well, sometimes. When I was a kid, I wasn’t allowed to eat any of the fun cereals for breakfast. I specifically remember the number– 13. My mom considered any cereal with 13 grams of sugar or more per serving as dessert only. Frosted Flakes, Lucky Charms– all the good ones– we only ate for dessert. Did you know Corn Pops were originally called Sugar Pops? And Honey Smacks were originally Sugar Smacks. My point is… cereal is sweet. It’s full of sugar. And therefore… it makes an amazing dessert ingredient. 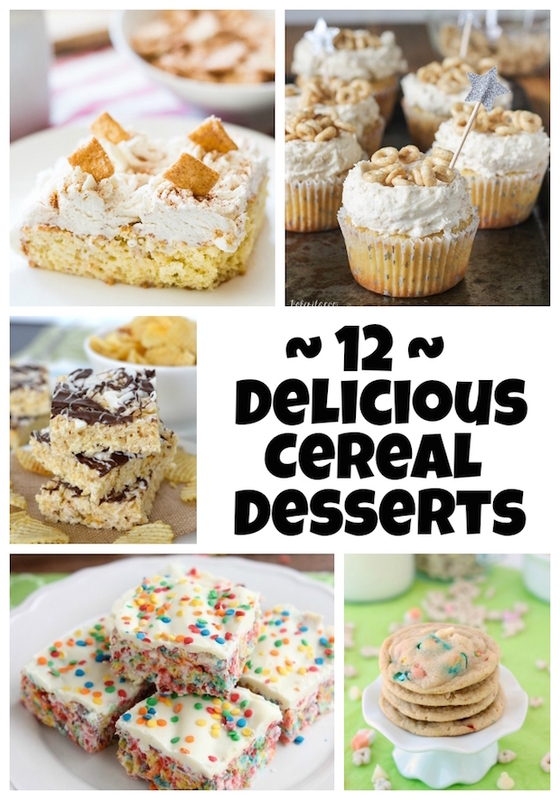 Here are 12 fun ways to use cereal in your desserts! These easy no-bake bars are made with Honey Nut Cheerios covered in chocolate and marshmallow. Yes, please! These moist and delicious cookies are packed full of every kid’s favorite marshmallow cereal! These honey cupcakes are topped with cereal milk frosting, then sprinkled with crunchy little O’s! Cereal and candy bars were meant to be together, so this sweet snack mix makes that happen! Some birthdays call for cake, some call for cereal bars! That amazing sweet cinnamon flavor in a fluffy cupcake! If Rice Krispies are too boring for you, make things more colorful with Fruity Pebbles! Sweet summer peaches, cool creamy ice cream, and cinnamony cereal. Winning. This is an amazing Cinnamon Toast Crunch-infused tres leches cake! Rice Krispies and chewy oatmeal gives these cookies some amazing texture! These airy cookies are crunchy, colorful and fun! Rice Krispies and potato chips team up for an amazing sweet and savory treat! Your turn… What’s your favorite way to eat cereal for dessert!? What a great list. This means I can have these for breakfast right? What a sad, sugary cereal less, childhood you had! I still love that stuff, my boyfriend makes fun of me for it! But I say there is no shame there! Love this fun round-up! Everything looks amazing! Thanks for including one of my mine! Thanks, Kelly! I definitely want to try your cake– looks so yummy!